Louis Payfer was the son of Henri Paul Payfer and Marie Catherine Éthier. He was born at Sainte-Geneviève de Pierrefonds on October 28th 1770. 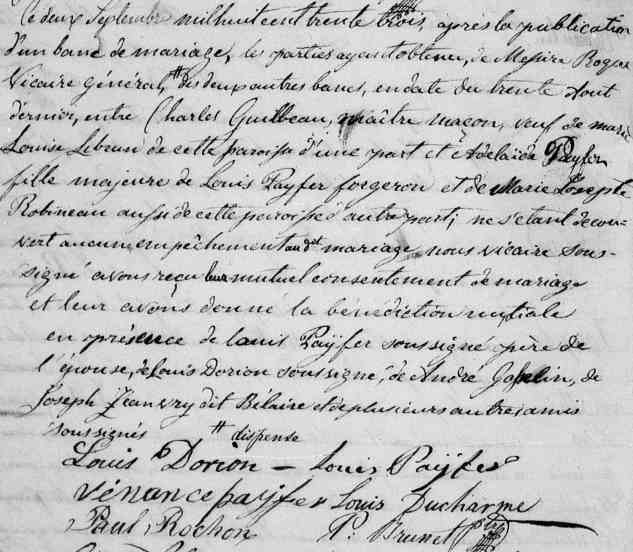 While living in Pierrefonds, Louis married at Sainte-Geneviève de Pierrefonds on June 18th 1798 Marie Josephe Robineau Desmoulins, daughter of Pierre Robineau Desmoulins and Marie Josephe Proulx Clément. 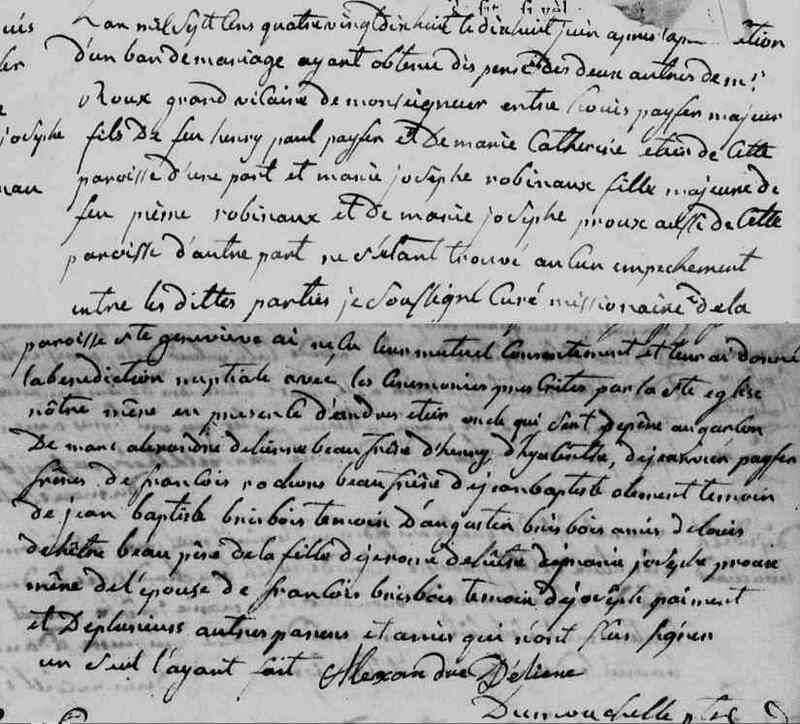 Were present at the wedding: André Éthier, the bride's uncle; Marie Alexandre Delienne, brother-in-law of the groom; Henri and Hyacinthe Payfer, brothers of the groom; Janvier Rochon, brother [sic] of the groom, François Rochon, brother-in-law of the groom and Louis De Hêtre, father-in-law of the bride. The mother of the bride Marie Josephe Robineau Desmoulins, widowed, and married Louis Deshêtres, a widower. There was dispensation of two bans. The officiating person and writer of the act omitted to sign. For more on the family of Marie Josephe Robineau Desmoulins, press HERE. 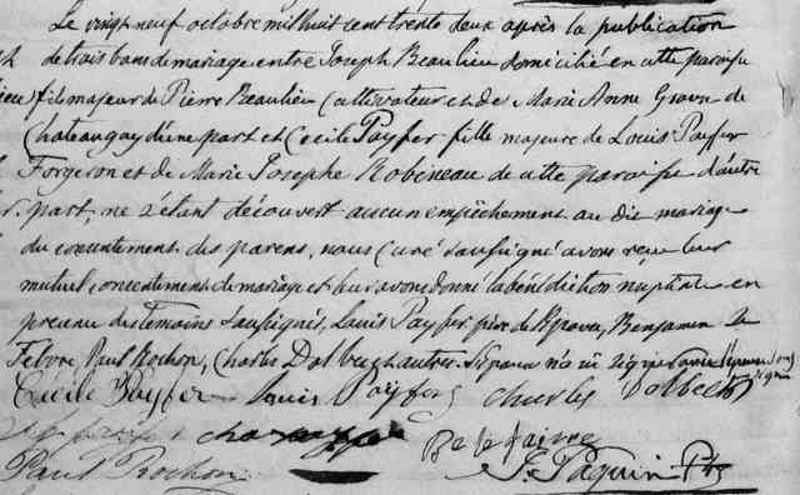 Jérémie Payfer, born in the parish of Sainte Geneviève de Pierrefond son 22 September 1801 and baptized the following day; his God-Father and God-Mother were Jérôme Dehêtre and Marguerite Paiement; he married Ellen Flynn; For more on them and their family, press HERE. Marguerite Cécile Payfer, born in the parish of Sainte Geneviève de Pierrefonds on 21 November 1810 and baptized the following day; her God-Father and God-Mother were Joseph Théorêt and Marguerite Claude. She married at Saint-Eustache on 29 Octobre 1832 Joseph Beaulieu.